Seven50 (“seven counties, 50 years”) is a blueprint for growing a more prosperous, more desirable Southeast Florida during the next 50 years and beyond. The plan was developed to help ensure a vibrant and resilient economy, and stewardship of the fragile ecosystem in what is quickly becoming one of the world’s most important mega-regions. Spearheaded by the South Florida and Treasure Coast Regional Planning Councils and the Southeast Florida Regional Partnership (SFRP), a unique collaboration of more than 200 public, private, and civic stakeholders, Seven50 mapped the strategy for the best-possible quality of life for the more than six million residents of Monroe, Miami-Dade, Broward, Palm Beach, Martin, St. Lucie and Indian River counties. The plan was devised through a series of public summits, workshops, online outreach and high-impact studies led by the region’s top thinkers. Seven50 has been made possible by a grant from the US Department of Housing & Urban Development’s Sustainable Communities Initiative. 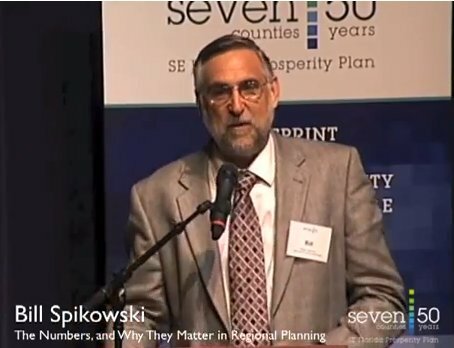 Click on the video below to watch a presentation by Bill Spikowski to the initial regional summit for the Seven50 plan. 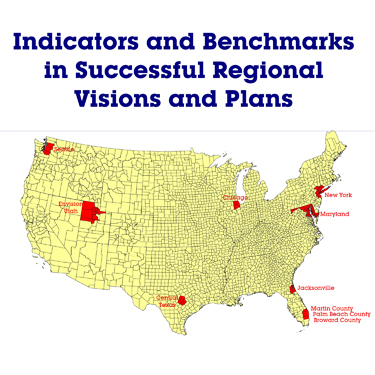 Click on the cover to the right below to download a copy of “Indicators and Benchmarks in Successful Regional Visions and Plans,” prepared by Spikowski Planning Associates to examine indicators and benchmarks that have been used around the country, either separately or as part of regional visioning efforts. Community indicators can measure progress toward policy goals in fields such as transportation or quality of life.